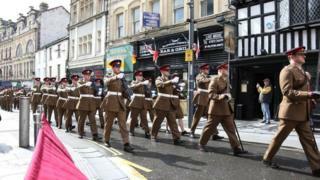 About 100 soldiers from the 104th Regiment Royal Artillery marked their 50th anniversary with a freedom parade through Newport on Saturday. The regiment has strong links to the city as an Army Reserve unit is based in Raglan Barracks and the Freedom of Newport was granted to them in 1978. They paraded through the city centre with colours flying, drums beating and bayonets fixed as they were led by the Band of the Royal Artillery. The parade started at 12:30 BST. It began on Cambrian Road before continuing on to Bridge Street and High Street to the D-Day Memorial where a short ceremony took place. The parade then reformed and travelled down High Street, across Stow Hill and followed Commercial Street to its junction with Charles Street and Llanarth Street.